Make a circle with a three-legged figure in the center, like a clock with three hands. At the top of the circle (12 o'clock) to the right of the line, place Winsor Lemon or Cadmium Lemon (or another color that looks similarly cool and lemony, but not Lemon Yellow Nickel Titanate. Place New Gamboge, Cadmium Yellow or Indian Yellow to the left of the line. Next, going clockwise around the circle to four o'clock, place Winsor Blue (Green Shade or Red Shade) or Phthalo Blue above the line and French Ultramarine below the line. Continuing clockwise to eight o'clock, place Alizarin Crimson or Permanent Rose below the line and Winsor Red, Permanent Red, Scarlet Lake or Cadmium Red above the line. Here's the rule: When mixing two colors on the wheel to achieve high-intensity color, don't cross the lines! Mix only the two colors in each section within the lines. To mix the green family, mix the blue and yellow within the lines to the right of the circle. First mix green, and place it midway between blue and yellow; then add more yellow for yellow-green and more blue for blue-green. 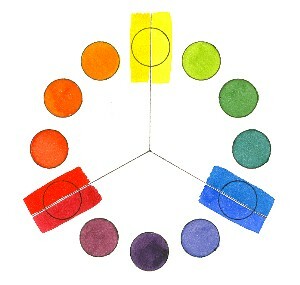 To mix the violet family, mix the crimson or rose with the blue within the lines at the bottom of the circle. First mix violet midway between blue and red, then add more blue for blue-violet and red for red-violet. To mix the orange family, mix the red and yellow within the lines to the left of the circle. First mix orange midway between red and yellow, then add more yellow for yellow-orange and more red for red-orange. To test the system, see what happens if you cross over the lines and mix the colors on the other side. You'll see that the mixtures become less intense and slightly grayer. For example, mix New Gamboge (across the line) with Ultramarine Blue (across the line) and the result will be an olive green hue, not a pure green. Read the third primary rule in the next article to learn why. To mix earth colors you simply cross over the lines to lower the intensity of the mixture or add Burnt Sienna to your mixtures. You may also go to the opposite side of the wheel from the color you are mixing and use its complement to modify the color. See also Exploring Color Revised pp. 48-49 and Confident Color p. 98-99.